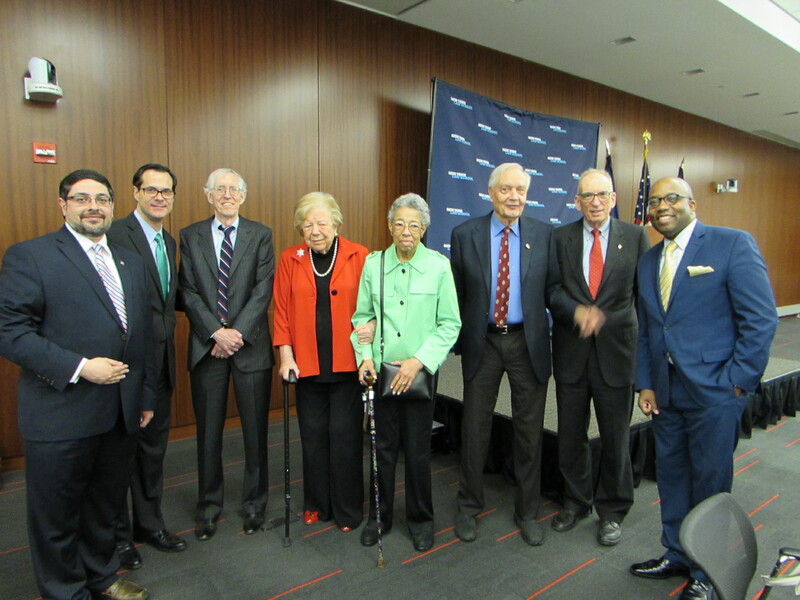 On Thursday May 26, 2016, the Center for New York City Law at New York Law School hosted the 134th CityLaw Breakfast and the 2nd annual Civic Fame Awards. The event speaker was Inside City Hall Host Errol Louis. Errol Louis was welcomed by Anthony Crowell, President and Dean of New York Law School and introduced by Ross Sandler, Professor of Law and Director of the Center for New York City Law. He spoke about the importance in recruiting young adults to engage in civic leadership roles, and called upon the Breakfast attendees to do the right thing, do everything on the books, and constantly question our elected officials. Ross Sandler and Anthony Crowell honored former NYC Conflicts of Interest Board Executive Director Mark Davies, former NYC Department of Juvenile Justice General Counsel Kay Crawford Murray, former NYC Law Department Corporation Counsel Frederick A.O. Schwarz Jr., and former Queens Borough President Claire Shulman with the Civic Fame Award for their excellence in serving the New York City government. To view pictures from the Breakfast, click here.